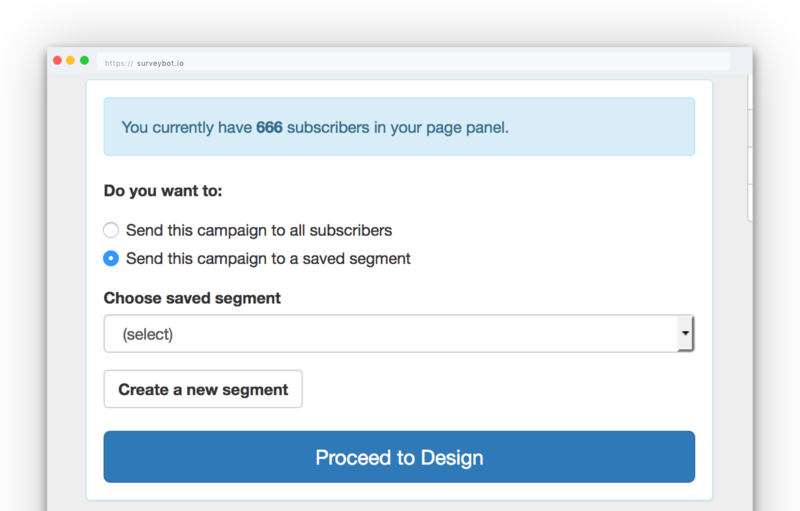 Create multiple campaigns to promote your surveys in different ways to different audiences. 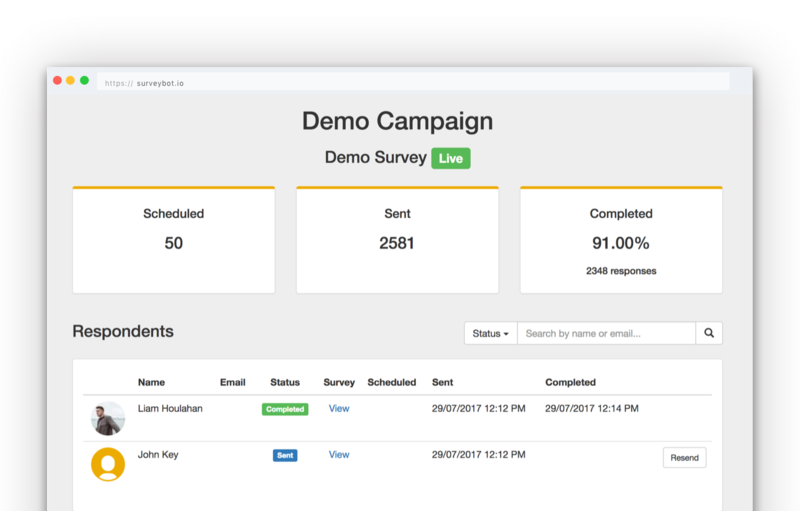 Track the survey completion rate performance of each of your campaigns. Target your panel subscribers directly sending them new surveys over Facebook Messenger. Send surveys over Facebook Messenger to your panel subscribers. 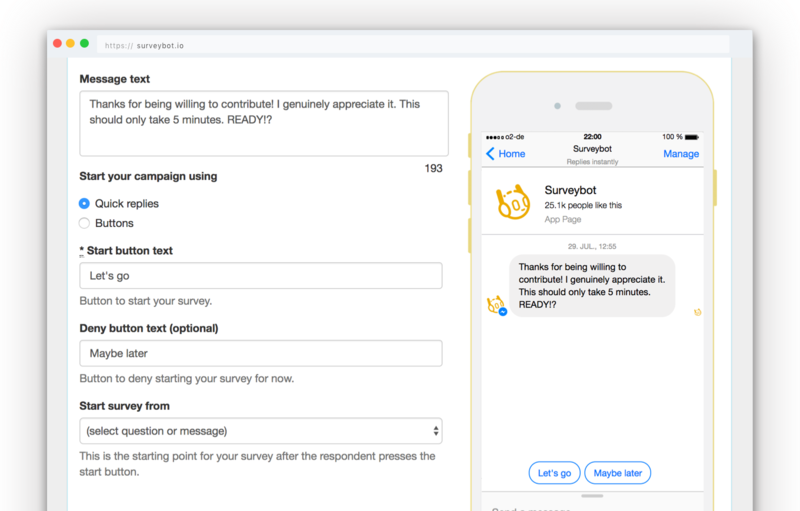 Create custom messages for each campaign to start your surveys. Customise the opt in buttons given to respondents to start a campaign survey. Send images with your campaign messages before starting the survey. 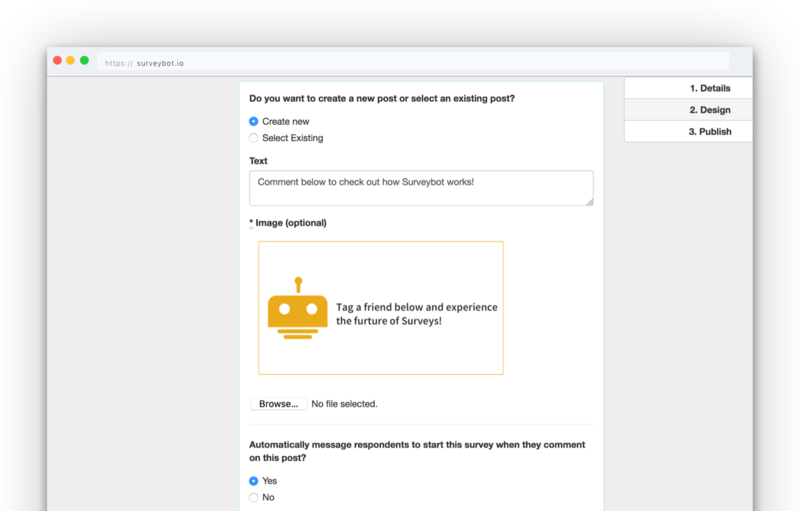 Create new Facebook Posts within Surveybot that link to your survey in Facebook Messenger. Auto message to start your survey when someone comments on your post. Link your existing Facebook Posts to auto start your survey when someone comments on the post. Link your surveys to Facebook Ads that automatically start when someone clicks your Ad. Create a custom message to be sent when someone clicks your Facebook Ad to start your survey. Automatically generate the chat bot JSON to paste in Facebook Ads Manager for your Ad Campaigns. Setup to automatically send follow up surveys/sequences on completion of another survey. Set your delay period for sending a follow up or send it instantly. 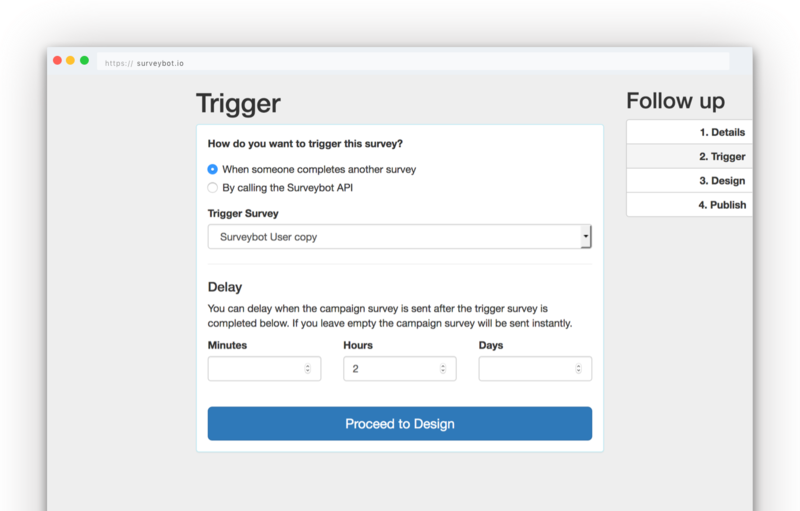 Create custom triggers by using the Surveybot API to trigger surveys. 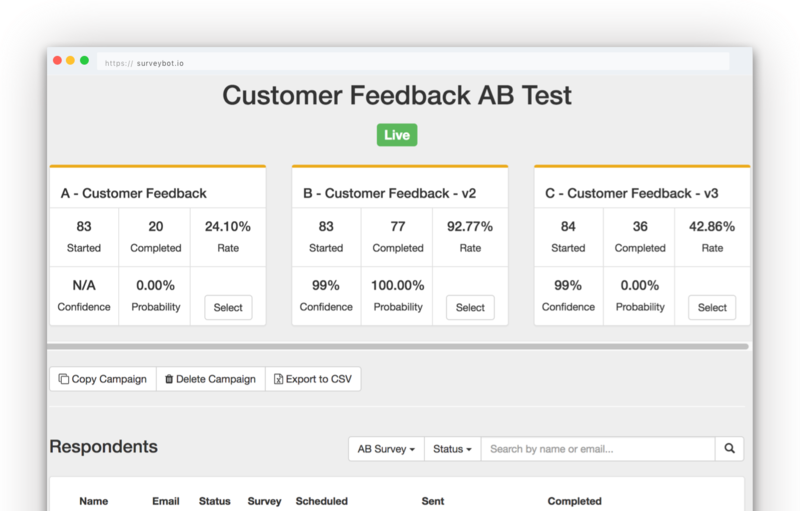 Test up to 6 variations of your surveys by comparing their completion rates. Surveybot will automatically calculate the confidence level and probability of each survey being the winner. Select the winning survey at any time and all future surveys in the campaign will be the winner. Setup your survey to send hourly, daily, weekly or monthly from the start time until the end time or when you decide to stop. Stop or continue the recurring survey if the respondent doesn't complete the previous interval's survey. 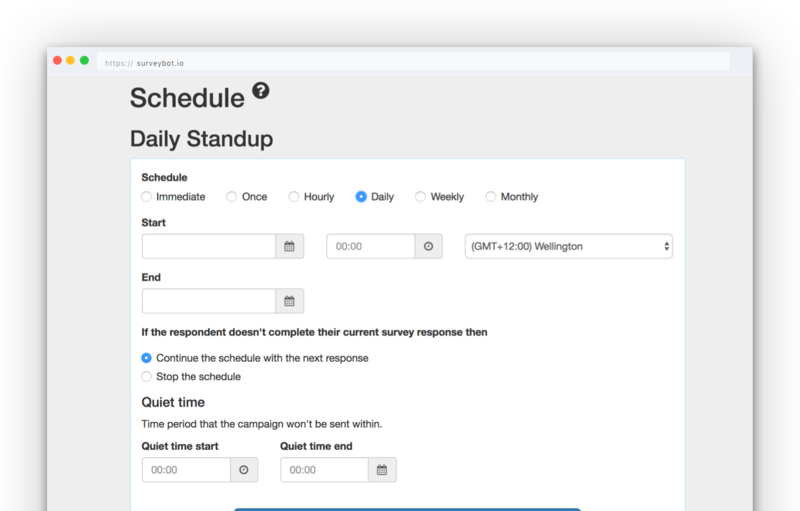 Set your quiet time so Surveybot doesn't message your respondents during periods that you don't want.